The Solomon Kane character was created way back in 1928 by pioneering sword-and-sorcery author Robert E. Howard. Howard also created the enduring comic book and film character Conan The Barbarian — which may account, in part, for Kane’s long delay in coming to the big screen. With a compelling story involving Kane’s debt to the devil for all the blood on his hands, the Kane story and character are quite compelling. Though never adapted to film until now, the character was a minor staple of the old pulp fiction magazines and enjoyed a significant comic-book run in the 1970s and ’80s. The film was first released in France in December 2009 and this behind-the-scenes featurette makes me long for the good old days when films almost always received first release in the US. But those days seem, more and more, to be a fleeting memory. 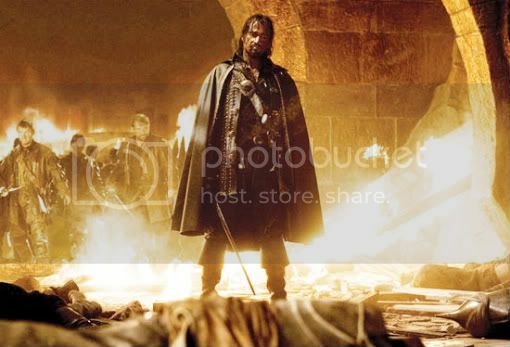 In any case, “Solomon Kane” looks like a damned compelling piece of filmmaking with terrific visuals and themes that are as old as storytelling itself. Purefoy looks pitch perfect as Kane — a ruthless, nomadic warrior with much to answer for regarding his misdeeds with the sword. Kane eventually sees the light but his renouncement of violence almost comes too late to save his wretched soul. His last chance at redemption comes in the form of Meredith Crowthorn (Rachel Hurd-Wood), a Puritan girl he meets in his nomadic wanderings who’s kidnapped by some very bad people. If Kane can rescue Crowthorn, he may, in the least, set himself back on the path of righteousness and give himself a chance to, ultimately, avoid Hell. Of course, a single act of kindness is hardly adequate to earn complete redemption — or to create a legitimate film franchise, if ‘Solomon Kane’ turns out to be a hit, that’s likely where he’s headed. The more quality comic-book franchises the merrier, I say. I’d like to be able to see this.